We provide a variety of traditional Bouzouki sets. The reason why Kalis & Co. Bouzouki strings are the choice of many professional, semi-professional and enthusiast Bouzouki players is that they offer great tone and longevity at a affordable price. Not only that but the ball end sets are extra long to fit most Bouzoukia with the plain steel Kalis Bouzouki strings featuring a special Lock Twist to maintain stable tuning. Loop end sets are extra long to fit most instruments. The loops are a special shape to fit a variety of tailpieces. Plain steel strings feature a special Lock Twist to stay in tune. 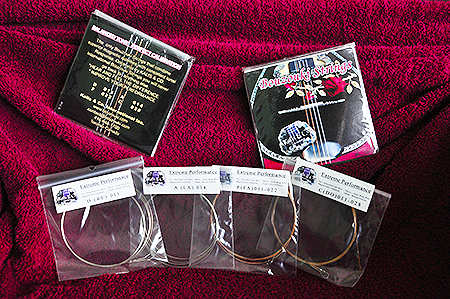 You can look forward to a great sound and longevity from these brilliant manufactured strings. Wound strings are bronze wound on steel. PLEASE NOTE that this set is intended for the Greek Bouzouki, tuning CFAD. Call us at 416-948-1700 for price or details.